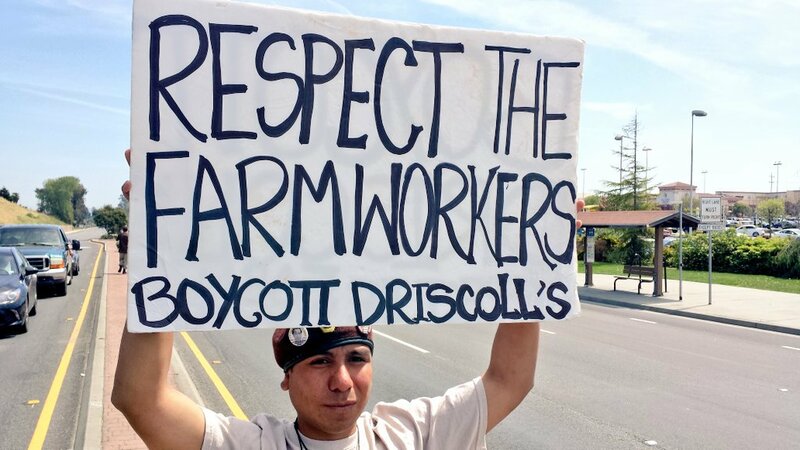 Chicago–Supporters of striking farmworkers in San Quintín, Baja California, Mexico, gathered at Pete’s Market on Cermak Road on April 5 to protest Driscoll’s berries and to urge shoppers to boycott Driscoll’s, the brand under which produce from San Quintín is marketed (see “Latina worker speaks,” Nov.-Dec. 2015 N&L). We first went into the store to request that Driscoll’s strawberries be removed from the shelves. Emmanuel Ballesteros of the Watsonville Brown Berets, standing on Main Street in Watsonville, Calif. on April 2, 2016. We then walked an informational picket line in front of the store, getting a favorable reception from shoppers, many of whom were Latin@. Despite keeping the store entrance clear, by the time we ended our picket line no fewer than 12 Chicago police had arrived to secure the premises. One cop at the end even claimed we were illegally using public space. Participants included several people old enough to have participated in the campaign of the late 1960s to boycott table grapes that aided farmworkers in gaining union contracts, including veteran organizers Al Rojas and Marcos Munoz, who recalled the historic march from Delano, Cal., that began with 100 marchers and arrived in Sacramento with 10,000. But most were youth for whom the hard-fought victories of farmworkers, and even the participation of the late United Farm Workers union president Cesar Chavez in a rally at this very location, were only history, but who were enthusiastically supporting the striking San Quintín farmworkers today. This entry was posted in Articles and tagged Al Rojas, Cesar Chavez, Chicago police, Delano California, Driscoll's, Driscoll's boycott, Latin@, Marcos Munoz, Pete's Market, Sacramento, San Quintin Baja California, United Farm Workers (UFW). Bookmark the permalink. ← I. Discontent, revolt and reaction in the U.S.